Final Fantasy Crystal Chronicles: My Life as a King is a video game developed for the WiiWare service of the Wii console by Square Enix. 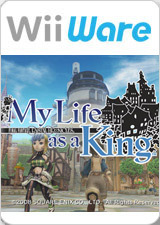 Square Enix decided to make a game for the WiiWare service that would be high profile, and it was decided that the game would be a simulation game and, later in development, a Final Fantasy title. The graph below charts the compatibility with Final Fantasy Crystal Chronicles: My Life as a King since Dolphin's 2.0 release, listing revisions only where a compatibility change occurred. 3.5-479 Windows 7 Intel Core i7 @ 3.5GHz NVIDIA GeForce GTX 660 D3D9 - Auto FPS with 1x Internal Resolution, 0xAA, and 1xAF; No slowdown or graphical errors present whatsoever. - Library work as house, I can walk thorugh library 3D model; - after loading ingame save - game randomly loose information about exploration level for each dungeon; - "Error" dingeon level 50, and dingeon level 7 - that can't be rached. This page was last edited on 16 January 2018, at 08:04.